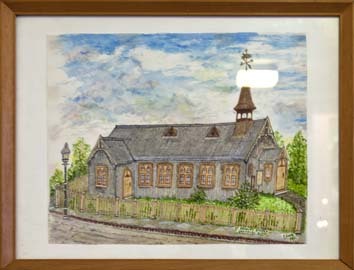 This chapelry was built in 1972 to replace a ‘tin tabernacle’ of 1904. This had served the eastern part of the town, along the road to Framfield. 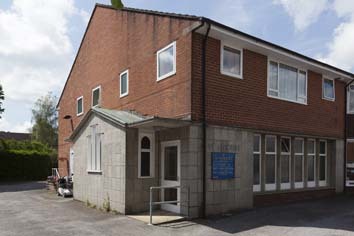 The stone-clad ground floor, with a rather minimal porch and short sanctuary, serves as a church, whilst the brick upper floor is used for residential purposes. 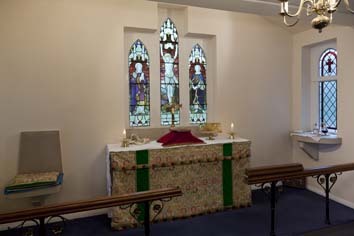 When not in use the sanctuary can be partitioned off, allowing the nave to be used for community purposes. Glass: (Three ‘east’ lancets) A L Moore, 1906 (www.stainedglassrecords.org retrieved on 28/3/2013). This was transferred from the previous church.